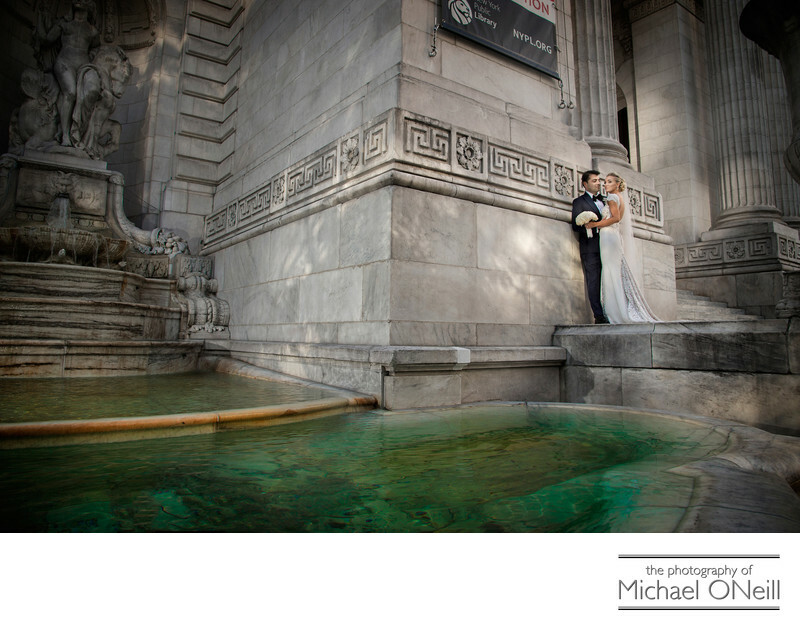 Another NYC wedding photograph incorporating the timeless architecture of the NY Library Building. This one was taken off to the side of the building with just a glimpse of the iconic columns in the background but a very good view of the fountains and reflection pool in the foreground. There are hundreds of places in Manhattan to take dramatic wedding photographs. As many as there are legendary buildings I suppose...and they are countless. I find myself gravitating to the NY Library building a lot. I am in love with it’s classic architectural elements and the views around the building are countless. Even on the busiest day in this most populous city you can always find a spot around this building that makes it appear as if it is yours alone. If you are planning a NYC wedding and wish to visit some of it’s iconic buildings for amazing wedding photographs, be sure to choose a photographer who is experienced in navigating The Big Apple. The logistics of traveling and parking around town can be a nightmare but is easily handled by professionals who know the drill. Your reward for the minimum effort will be some of the most dramatic and elegant wedding photographs ever.